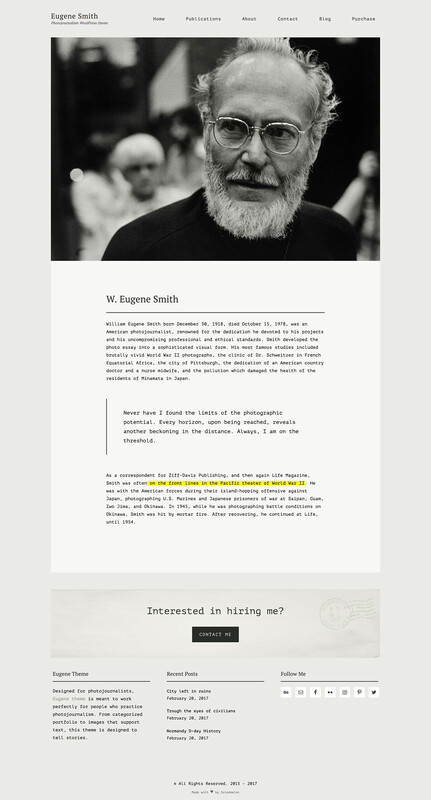 Say hello to Eugene – a portfolio for photojournalists and storytellers. 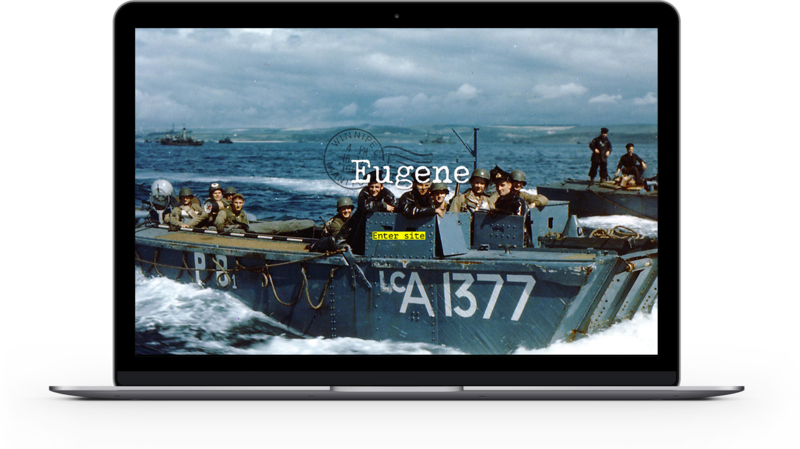 Eugene is made for photographers who need the ability to add generous amounts of text alongside their images. 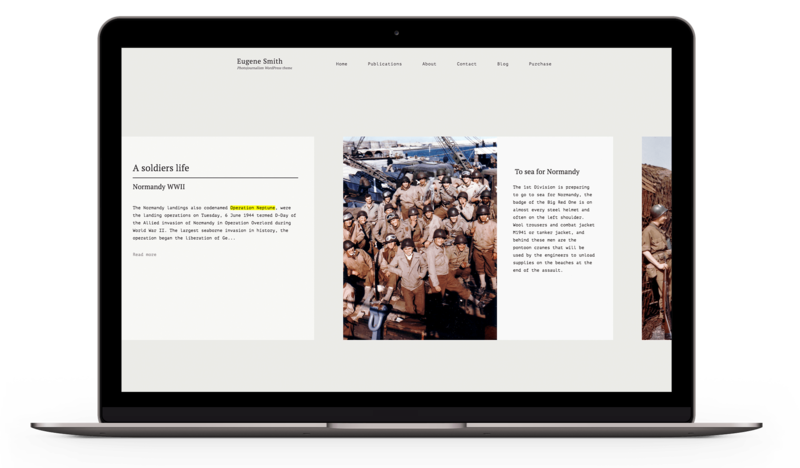 Eugene portfolio theme has a nostalgic journal, document design feeling, meant to remind you of the times when portfolios were printed not digital. Filled with little accents, like typewriter font faces, warm, paperlike colors, and layouts that remind you of retro media, Eugine has a soul of its own. Add your stories to this theme and complete the look. 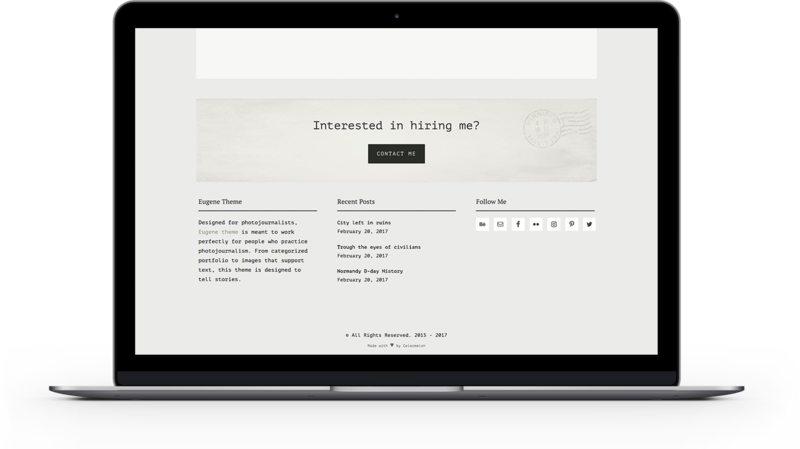 Eugene is portfolio is made with the most recent web development practices, meaning that it’s fully responsive (fits on any screen size), fast and user-friendly. Eugene portfolio was designed for people who need multiple portfolio categories with different galleries in each category. The gallery images themselves can support large amounts of text or just images. 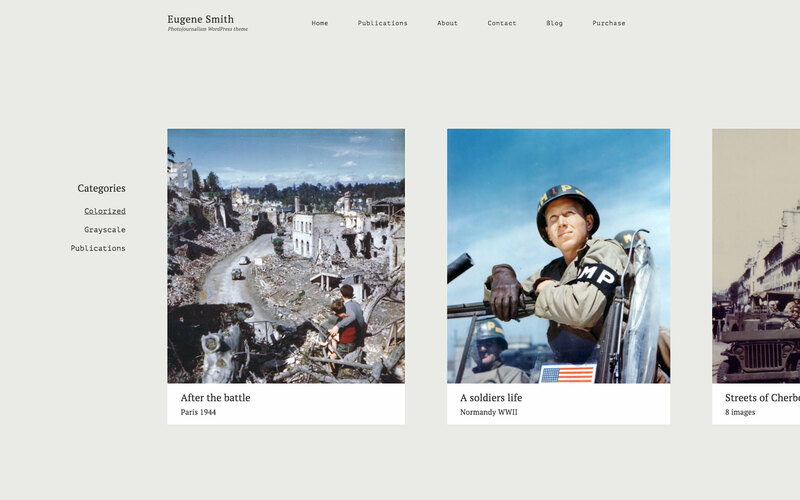 Eugene portfolio pages are arranged in a smooth scrolling horizontal layout. Categories are located on the left side of the screen for fast and convenient navigation. Each portfolio category can hold multiple galleries that are listed on the left side of the screen. Each image in a gallery can have its own title and description if needed. 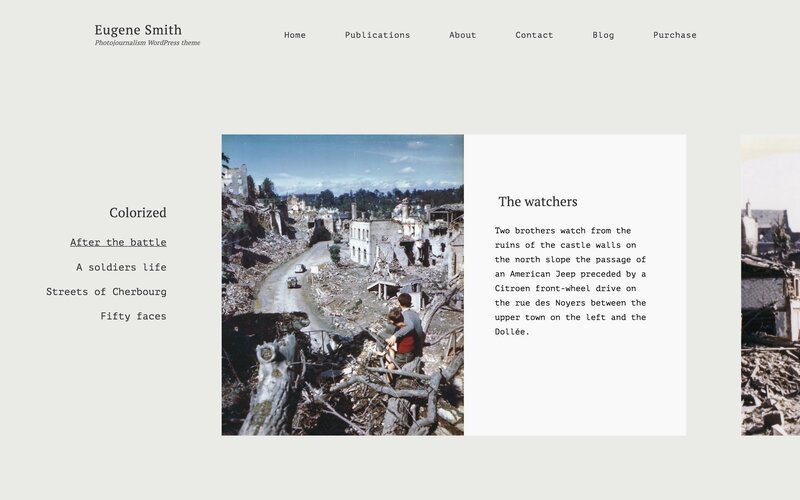 Eugine photojournalism theme comes with a classic yet stylistically unique blog layout. Eugene was designed to remind you of physical, printed material. 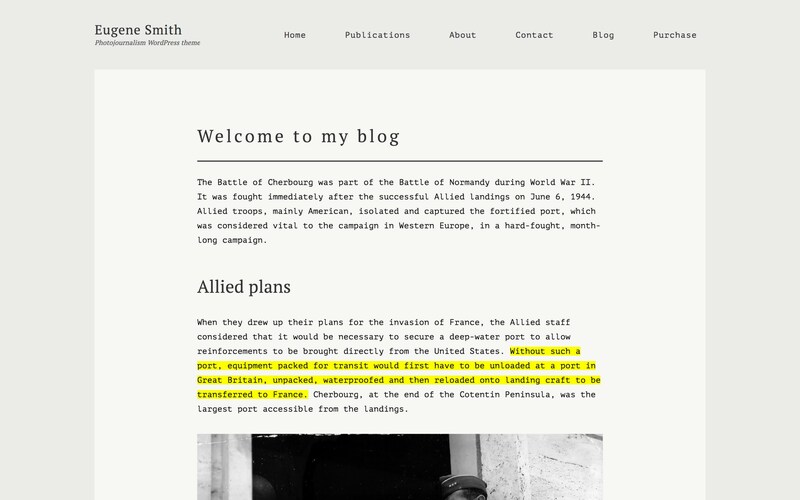 That is why it’s filled with little stylistic elements such as slightly off white color for the content area. 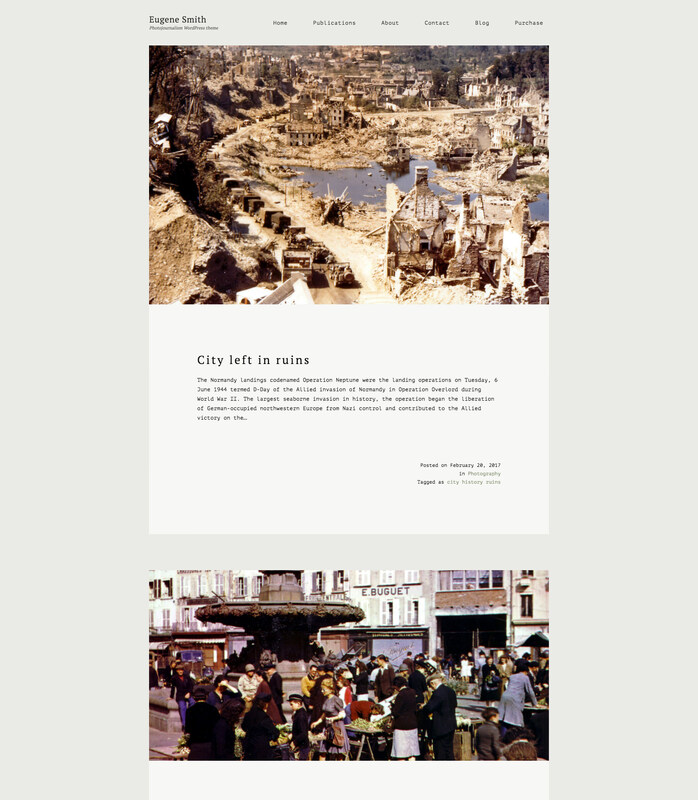 Large, end-to-end cover images where designed to that look as if a printed photo would be attached to a piece of document. Eugene has an option to highlight parts of the text as you would with a highlighter pen. Eugene is not only stylistically beautiful but easy to use and functional as well. Option to create a full-screen Welcome page that shows up when someone visits your page for the first time. You can upload multiple images onto your welcome screen slider as well as your custom logo image and “Enter site” graphic. Welcome screen can be disabled. In that case, your site visitors will be led straight to your homepage. Make contacting you easy for your site visitors. Activate a “Call to Action” area in all your vertically scrolling pages! What are you waiting for? Check out the live Eugene theme demo now!